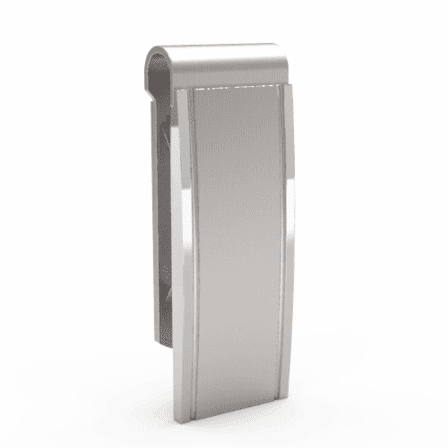 For an elegant look that will last for years, the brushed stainless steel Classic Collection money clip is a winner! 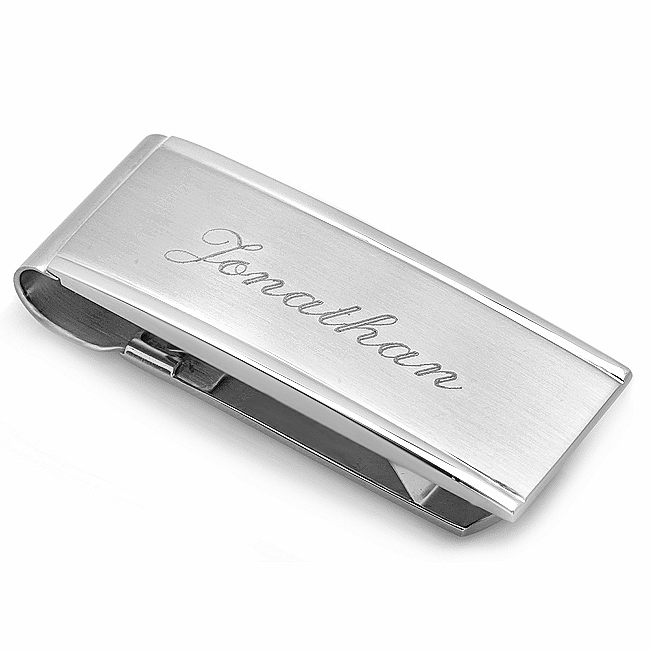 The highly polished edges create the perfect frame for your engraved name, monogram or message, and the spring-loaded mechanism holds up to 25 folded bills with ease. 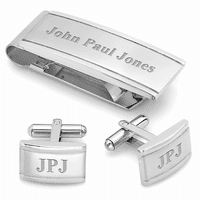 This is a wonderful gift for groomsmen, graduates, or your favorite guy's birthday or Father's Day! Engraving is free, and your money clip is packaged in a gift box. Would you happen to have image in a black and white adobe illustrator .eps file? If so, we might be able to. Please let me know. Will my message come out black or silver? The engraving will come out silver. The black in the personalization preview is just to show you placement and size. The text is actually etched into the metal with a diamond tip engraving bit. Would this fit 'the mountains are my true wealth'? Sure, just add your engraving instructions to our comments section when checking out. The type will have to be a little on the smaller side but we can definitely fit it. 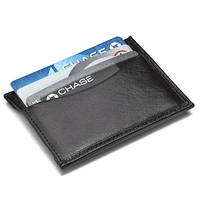 I would like to buy a money clip that holds a lot of credit cards. What would you recommend? This spring loaded clip or the "smart clip with the credit card holder"? We would recommend the spring loaded grip if you need to hold more than 2 or 3 cards. The spring loaded grip money clips will hold 6 or 7 credit cards, the smart money clip will only hold 2 or 3. Are the initials all the same size or is the last name initial larger in the middle? The intitials are all the same size on this money clip. Where does the engraving go? Which font is best on this money clip? The engraving is centered in the satin finish area. It is centered both left to right and top to bottom between the polished top and bottom border. The font we like best is the century block font. It is a nice classic font, with great detail but easily legible. What is the difference (advantage / disadvantage) between the french fold and spring mechanism? The french fold is one solid pieces folded onto itself. The spring loaded money clips have a spring that pushed down on your money/credit cards. The french fold has a tighter grip, but holds less. The spring loaded money clips don't hold your bills or cards as tight, but can hold more of them. This was a very nice piece the engraving was a bit smaller than I had anticipated but overall my husband is very pleased with it. Great customer service - but the engraving is basically impossible to read - need a different way to engrave. Spring is weak, you need a big bundle of bills, to keep your cash from falling off , disappointed with this item I ordered for my husband B-Day. ConsI now, have to go and try to find a spring loaded money clip somewhere else,that actually holds bills without folding them really small, just so they stay on the clip. The clip is a gift for Xmas, so the recipient hasn't opened it yet. I thought it was nice, and was shipped in a nice box ready to wrap. I also received it in a timely manner. The only complaint I have off rip is that the engraving is extremely shallow. Before buying this, I read several reviews, all of which were mostly good, but one about the engraving being shallow. I ordered and hoped for the best. I can't really judge the quality until he uses it for a bit and see if it wears or tarnishes. Overall happy, I just hope his name doesn't wear off quick like I think it might. I am happy with this purchase although I have not yet given it to the gift recipient. The engraving came exactly how I expected and it was received quicker than the estimated time stated for delivery. The headline is well done & explains the product well along with the photos of the product. 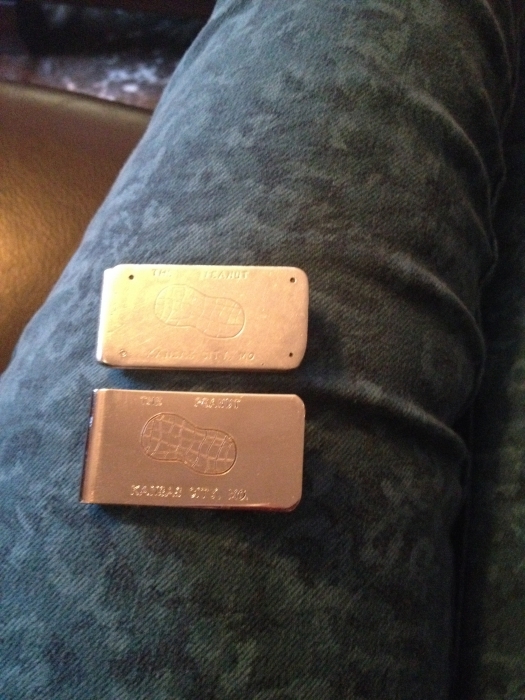 The money clip was very nice quality & the engraving was beautiful . 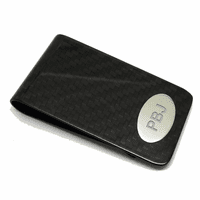 I am very pleased with the money clip & the service I received from the company. I loved my experience with this website. It was very easy to order. The engraving was a great touch. I received it within a week and it looks great. I can't wait for my boyfriend to open it at Christmas. This is so nice and the engraving also. I am so excited to give this to my husband at Christmas. We were so pleased when we received this money clip. Its a gift for our son. The clip is great and the engraving is beautiful, thank you! Item came nicely boxed and engraved. Looks great. I purchased this item for my brother as a Christmas gift. He loved it! The engraving was perfect. The item was prepared and shipped in a very timely manner. Any distinguished gentleman would enjoy having this high quality item. Ordered this for my daughter's godfather. She was able to personalize it but the font came out smaller than expected. She did have a lot of characters but you can tell there was still enough room to make it a little larger. Overall we are satisfied. Looks great and works without fear of bills coming separated from clip. Wish I had it a long time ago. Ordered this as a gift. Liked that the engraving was included. Nice looking money clip. Beautifully engraved. Holds money in place and is not too heavy. I bought this for my nephew who just graduated high school. I had a small quote engraved along with his name. I was a little worried, thinking the print was going to be a little too small, but took the chance. I absolutely loved it. The print size was perfectly legible and looks stunning. I had read reviews that the clip seems flimsy, but from what i can tell it seems very sturdy. I have not given it to him, I will not see him for another few weeks, but i will make sure and update my review if my current view of the products changes. I absolutely love the money clip. The mechanism is great, exactly how I wanted it to work, holds many bills and is sharp looking. I selected the "Old English" engraving and it added a sophisticated touch. Definitely an excellent product and surely one that would make an attractive gift, especially at this time of year - graduation. This is a great item its just what I visualizedIt would be thank u v m! ProsGood strong money clip. Love it. The spring is actually falling apart, I have to put it back in sometimes and I have not owned this for more than a week. Merchant Response:Hi Ang I'm so sorry you're unhappy with this money clip. It sounds like you may have received a defective money clip. We'd be happy to ship you a new one free of charge of the same or a different style. Would that work? I tried looking up your order by your email but nothing came up. 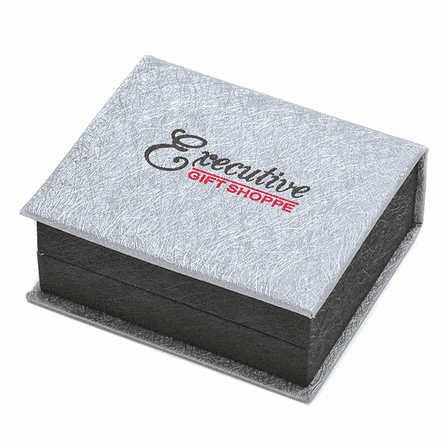 Could you email us at help@executivegiftshoppe.com with your order # or the name your order was placed under so we can resolve this for you? poor quality the finish is wearing off all ready and have not had it for even three weeks. Merchant Response:I'm so sorry that the finish is wearing off on your money clip, that definitely should not be happening. Would you consider a replacement, either of the same style or a different style being sent out free of charge. Please email us at help@executivegiftshoppe.com and let us know if this would work. First of all, the engraving is very shallow. You can barely read the words. Secondly, after maybe two weeks, the clip fell off. It's completely unuseable. $39 is a lot of money for the quality of this money clip. This was a gift to my son for his $19 birthday, and I had hoped he could use it for years. Very disappointing. ConsEngraved letters aren't very deep. Hard to read. Broke after 2 weeks. My boyfriend loved the money clip! He thought it was perfect since it has a spring to keep the money tight. I liked the look of it as it came out very clean with the engraving. I would highly recommend it. The money clips came in 2 days. They look great! Hope the guys like them.